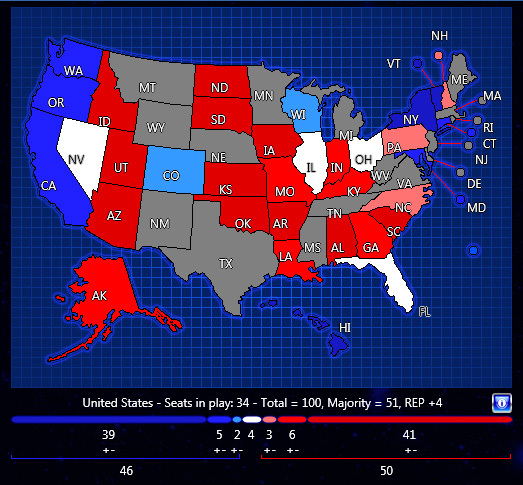 In the latest release of Congress Infinity, there are significant changes to the Senate races. In particular, Florida (Rubio running for President), Ohio (Fmr. Gov. Strickland in), and Nevada (Senate Minority Leader Reid retiring). As can be seen in the screen capture, there are 47 ‘safe’ seats for Republicans in the game when you start as of now, 44 ‘safe’ for the Democrats. There are 9 seats which will probably determine who has a majority in the next Senate. Those are Florida, Ohio, Illinois, Nevada, Wisconsin, Colorado, Pennsylvania, North Carolina, and New Hampshire. Republicans need 4 of these to retain majority control, with 3 of them leaning Republican to start. That means – given the current map – they probably have to win one of Nevada, Illinois, Ohio, Florida, Wisconsin, or Colorado to keep majority control of the Senate. We’re still a ways out, and more major shifts in these states could of course occur. Yet, one thing this suggests in particular is that Rubio’s decision to run for President could have significant repercussions beyond the Presidential nomination. More info on Congress Infinity is available here.